At Shareaholic we take transparency and privacy very seriously. Being transparent with your visitors builds real confidence in you, your business and your site. Today, we’re releasing a new app that will help you do just that on your own site! With this app, you also get closer to complying with the EU / UK cookie disclosure requirements. Best of all, it is ridiculously easy-to-enable and it is free. In case you’re not familiar with the EU / UK cookie law, Wired UK covered the topic here (and here’s another article worth reading). When we were testing this feature, one of our users, Derek Price, noticed it and wrote a short piece about cookie compliance, also worth reading. Our advice? Enable the consent banner. 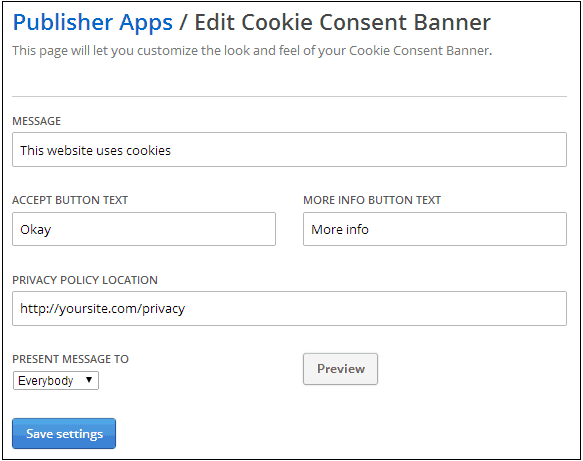 Even if your site doesn’t cater to an EU / UK audience, you may still want to use the Cookie Consent Banner App. And regardless, being transparent with your visitors will build real confidence in you and your business. and earn even more reader trust and confidence! If you don’t yet have Shareaholic installed, we invite you to access our full suite of publisher tools here, and do let us know what you (and your readers) think of the Cookie Consent Banner App. We’re trying very hard to deliver a service that is loved by everyone, and your feedback and advice is an integral and very valuable part of making that happen. First, sign into your account (or, if you’re using one of our CMS plugins ex. WordPress, click on “Edit General Settings” from within the plugin), and notice that the Cookie Consent Banner App is now available. Toggle the little button on the far right to turn Cookie Consent Banner on (green). Note: By default, it is turned off (red). Tell ’em what they need to know. Edit the “Message” box to inform your readers what’s going on. Inform all visitors or visitors in the EU (including the UK) only. In the “Present Message To” field, there is an option to select which audience you’ll present the Cookie Consent Banner to. Choose between “Everybody” or “EU Visitors”, which includes visitors from the UK. We use the MaxMind GeoIP lookup database to determine the country. Then see it in action. 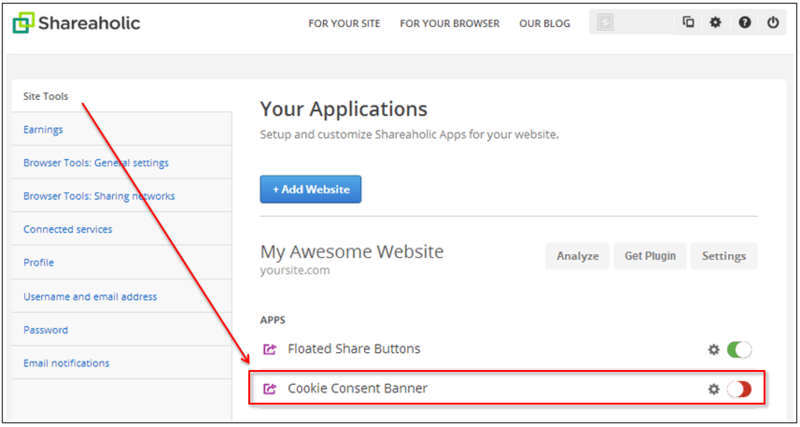 Click “Preview” to see how your new Cookie Consent Banner would look on your site. Love it? Hit “Save Settings” at the bottom. Hate it? Edit the settings again until it’s perfect :-D otherwise let us know how we can make it better by sharing a bit of feedback. Btw, the banner IS 100% responsive, in other words it will work and look great on mobile and tablet devices. The nifty banner appears at the top of a page, whenever a new visitor first arrives at your site. It’s simple, non-intrusive and 100% mobile-ready. Once the visitor clicks OKAY, the banner disappears forever. Easy, right? What do you think of this new feature? We’re listening :) Want to ask a clarifying question? Drop a comment below!